The impossible (or how to seek perfection in asana). 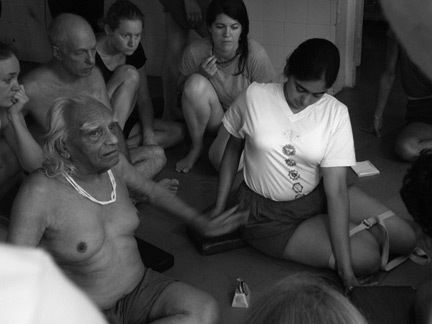 Last year, during a class I took with him in India, Prashant Iyengar talked about the tendency of some yoga practitioners/teachers to become obsessed with the instructions. I don´t know very much of how is this in other methods of yoga practice but, in Iyengar, it´s pretty easy to talk a lot about the physical body, giving endless instructions. It´s easy to feel that there´s no such a thing as a perfect asana: you can always improve; reach a deeper level, go further. Being able to fill with consciousness/energy/intelligence every corner of your body (as Guruji does) it´s, undoubtedly, a big challenge. This challenge, in my experience, requires you to become more and more sensitive, helping you to have the control of what is happening not just with your body but with your whole being in an asana. Because, as Guruji would say it: how do you want to go further in the limbs of yoga if you aren´t able to understand what is happening to your own body? We can hear instructions like: keep the nail of every toe parallel to the floor, move the back ribs away from the lumbar spine or move the groins inside your body…Sometimes just “open your chest” it´s a really difficult thing; putting all of them together while you´re doing –for example- an intense backbend it´s seems sometimes, impossible. Maybe that´s exactly why we keep looking for it because, going after a difficult goal makes the way worth it. Sometimes, while I´m practicing, I like to shut the instructions up thinking: “Ok, Ale, you´re here, doing your best, instead of try to move further in the posture, try to move deeper into this moment.” I keep all the actions of my body but I´m there still in connection with my breathing and with the perfection of that second. I think it´s in these contradictions where I find freedom in the practice. This is how I see it: Even though I know that my asana it´s not perfect, even though maybe the alignment of the skin of my calves or back it´s not ideal and, I know that there´re many things I´m not aware of because (for example) the tension on my neck is taking all the attention, I´m still trying hard to do it in the best way I can, with honesty and humbleness. And, when I get to that point, I like to be in silent, inner silent, maintaining, observing, and feeling good because I reached my best level in that moment. I like to think that a part of us knows that it doesn´t make logical sense to go to the practice and try to find “perfection” because there will be always something better, deeper, more aligned but, anyway, we´re trying to do it in the best way we know, thinking that, if we´re able to experience the joy of being in this un-perfect condition, how would it be like if we were doing it perfect? Who can say where it will end? Next Next post: Abhyasa, practice.